Colorado Gift Baskets Inspirations: 5 Beautiful Places To Visit in Colorado this Valentine’s Day! – Denver, the state capital, is known as the mile high city. Filled with museums, shopping and outdoor activities, there is something for the entire family to enjoy if you’ll be bringing the kids along! – Parker is a self-declared town, which makes it the 2nd most populous town in the United States. Parker is known as a commuter town at the southeastern most point of Denver. Also, Bisket Baskets stems from this great town. 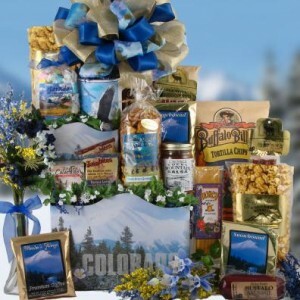 Our Colorado gift baskets are made and designed by true Coloradans! – Aspen is a great place to visit for the avid skier, as it sits on the Rockies. Also a great place for shopping and other outdoor recreation. Overall, a well-known tourist attraction that deserves its popularity. – Telluride is home to many film festivals including the Sundance Film Festival and other festivals held during the year. Also another tourist attraction for skiing and winter sports. – Boulder is located at the base of the Rocky Mountains and also houses film festivals. Boulder is a great place to explore, shop, hike or bike. Also houses some beautiful views of the mountains! Colorado gift baskets are great for people who live in Colorado, enjoy the state, or will be visiting it and falling in love with it soon! How a Healthy Family Meals Gift Basket can Help Kick Off the New Year! If there are two resolutions that are heard most often throughout New Year’s eve, they are “I’m going to lose weight” or “I’m going to eat healthier.” This can sometimes be difficult, of course, due largely to the fact that we all have extremely busy lives and schedules. So why not get that person pursuing this new lifestyle a Healthy Family Meals Gift Basket from us? This gift is perfect for someone trying to keep their resolution! With a fantastic selection of meals, including chili, veggie rainbow pasta, healthy chicken and dumplings, and roasted corn chowder, they’ll have tasty treats that are nutritious and delicious for the whole family! In addition to the scrumptious meals included in this basket, there are delightful desserts included, too! Healthy sugar cookies, amaretto cheesecake cheeseball dessert mix, and a delectable chocolate pastry to eat after your healthy meal. 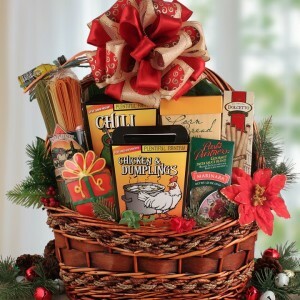 Who wouldn’t want this delicious gift basket to kick off their new year the right way? Want to shop our Healthy Family Meals Gift Basket or other family-oriented baskets? Visit us today at BisketBaskets.com!